It certainly should not be understated that no two wedding ceremonies are the same, and with this, we ensure to bring a splendorous and beautiful range of mandaps and ceremonial decoration to bring peace and spirituality to any ceremony. This mandap offers awe-inspiring grass pillars, holding aloft an intricately-designed covering ring, designed and hand-crafted in traditional patterns and flourishes. The centrepiece and seating arrangement, too, carve out an inspirational and beautiful appeal, with flourishing spirals and curls adorning chairs and archways alike – this truly is a mandap with a centrepiece to balance out its pillars and covering. This mandap demands outdoor use and completes a stunning external ceremony ideal for a warm day or clement weather. 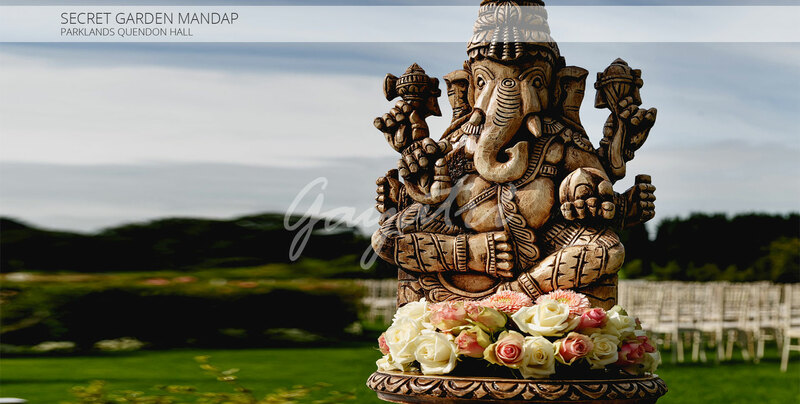 While this mandap is just one of our outdoor wedding ceremony solutions, it is popular for its links with nature and striking structure, as well as for its decadent seating and centrepiece arrangements bringing beauty and luxury to any wedding.